The Cinerama Dome, home to the vintage wide-screen Cinerama format (think of it as the IMAX of its day), turns 50 on November 3. In honor of the iconic theater, which was renovated by its ArcLight Cinema owners in 2002, we take a closer look under the lid. 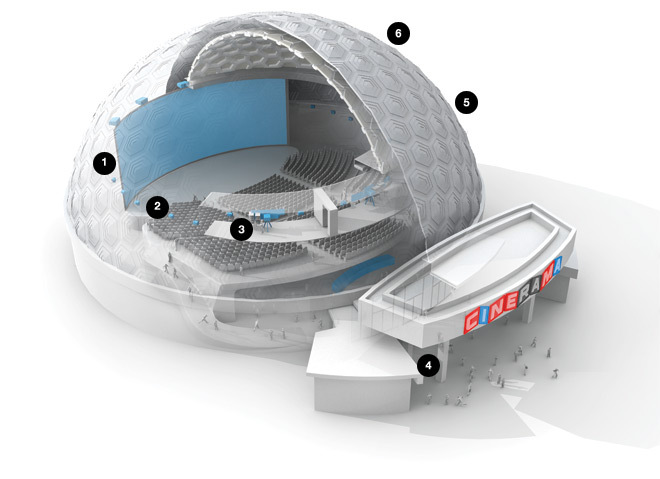 Constructed in just 16 weeks, the dome is the only concrete geodesic building in the world. Designed by the architecture firm Welton Becket, which also crafted the Capitol Records building, it was conceived to be the first of 300 theaters. However, creating a 525-ton structure for $3 million proved too expensive to franchise. This one earned historic-cultural monument status in 1998. The exterior is composed of 316 hexagon- and pentagon-shaped concrete panels, some as large as 10 by 12 feet. On the inside the ceiling pieces are covered with soundproofing material to improve acoustics during movie screenings. The system was made up of some 2,200 strips of overlapping screens, stretching 86 feet wide, which best display the three-projector Cinerama format. They were later replaced with perforated fabric optimized to show 70 mm film. To fill the cavernous room, five evenly spaced stage speakers hang directly behind the screen, 12 subwoofers echo the deep explosive boom of blockbuster scenes, and 48 speakers placed throughout the theater guarantee the audience is listening. The theater houses three Cinerama projectors, which are designed to run simultaneously to compile a single continuous picture. By the time the theater was completed in 1963, the Cinerama trend was over. The special projectors were not installed until after the theater’s renovation a decade ago, and the theater showed its first Cinerama film in 2002. It remains one of the few venues in the world with the capacity to play the obsolete format. Shaded by the famous marquee, the former box office is adorned with its original terrazzo floor. The first film to be shown at the theater was It’s a Mad, Mad, Mad, Mad World, an ensemble comedy featuring Milton Berle and Spencer Tracy, on November 7, 1963.